Buy Asphaltum Varnish for Sale here. A quick drying Asphalt Pigmented Varnish. Glaze with Asphaltum-Varnishes Golden to Black tones over Copper Leaf and Aluminum Leaf. Asphaltum-Varnish has a wonder range of color that starts off golden and then only becomes richer and deeper in tone eventually ending up with Black. Asphaltum-Varnish can easily faux silvers into gold. Letterhead Sign Supply sells Asphaltum-Varnish to Professional Sign Painters, Pinstripers, Gilders, Faux finishers and Antique Restorers. An example being a wood worker Fauxing wormholes wants the aging patina to look authentic, because of the age of the base pigment asphalt (millions of years old) that Asphaltum-Varnish is Black, it gives the artist the perfect combination to accomplish this task. Sign Painters use this product for blending corners decorations on Fire Trucks the same way Sign Writers did in 1890. 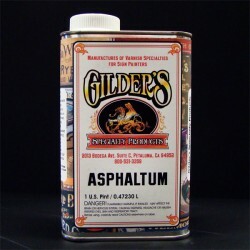 Asphaltum-Varnish is used by Gilders as a Glaze or for Reverse Glass Gilding. When Acid Etching glass for Embossed-Glass Asphaltum-Varnish is a chemical resist after 4 coats are painted down. Read more and Prices.